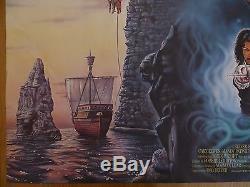 The Princess Bride' (1987) original UK quad poster (40"x30"). 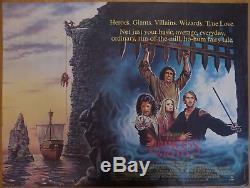 Family adventure starring Cary Elwes, Mandy Patinkin and Chris Sarandon. Also features Peter Falk (Columbo), Billy Crystal and comedy legends Mel Smith and Peter Cook. The poster has a pinhole at the top corners and a small crease at the bottom right corner (see pics). It is otherwise in excellent condition with no tears or paper loss and strong colours. Originally folded but has been stored flat for a long time and so the foldlines are barely visible now and it presents very well. Amazing artwork on this quad. Add me to your Favourites list. 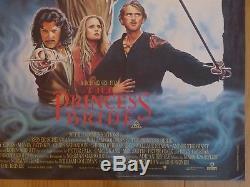 The item "THE PRINCESS BRIDE (1987) original UK quad film/movie poster, adventure" is in sale since Friday, August 18, 2017. 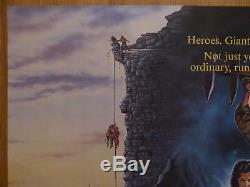 This item is in the category "DVDs, Films & TV\Film Memorabilia\Posters\Originals - UK Quads\1980s". 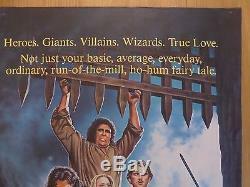 The seller is "richerposters" and is located in Warrington. This item can be shipped worldwide.